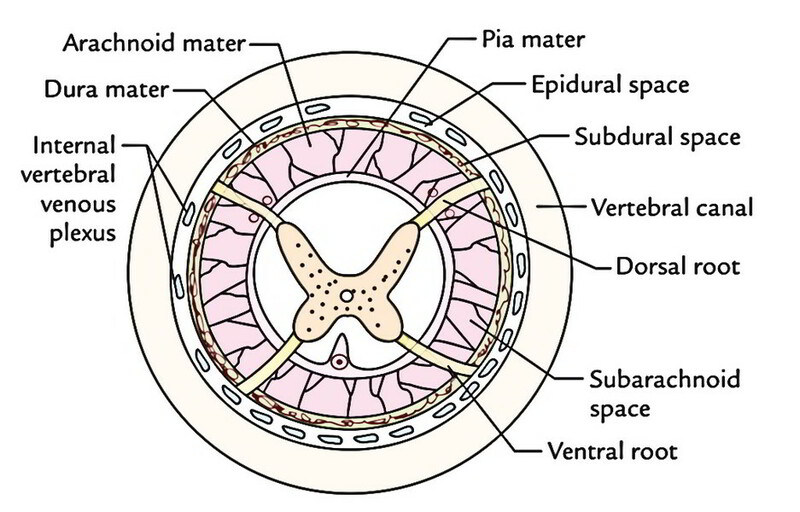 The space between the spinal dura and the periosteum lining the vertebral canal is called epidural space. It includes (a) tiny spinal arteries and (b) a network of veins-the internal vertebral venous plexus and Its filled up with loose areolar tissue and semiliquid fat. All these are segmental arteries, which originate from ascending cervical and deep cervical arteries in the cervical region, from posterior intercostal arteries in the thoracic region, from lumbar arteries in the lumbar region and lateral sacral arteries in the sacral region. They go into the vertebral canal via intervertebral foramina along the spinal nerve roots. They supply spinal cord, its nerve roots and meninges and the surrounding bones and ligaments. 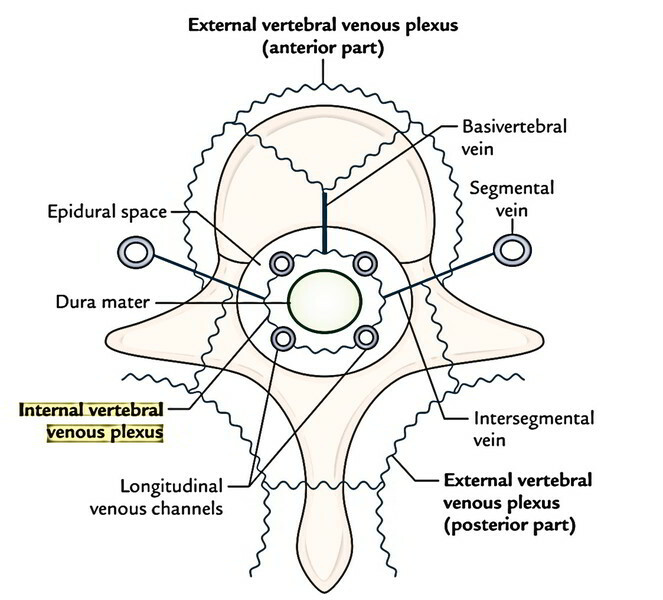 The internal vertebral venous plexus is a network of veins in the epidural space of the vertebral canal and goes through the length of the vertebral canal. These veins correspond to the dural venous sinus inside the cranial cavity and are constant with them via the foramen magnum. The plexus is emptied by 4 subordinate longitudinal stations: 2 posterior and 2 anterior. 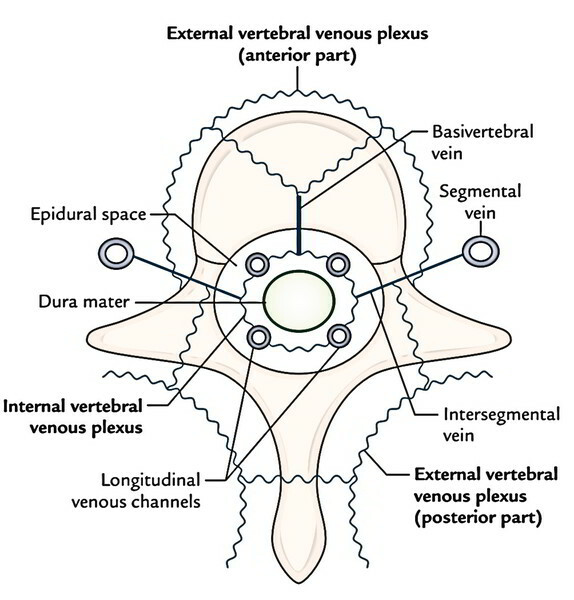 The anterior part of plexus gets large basivertebral veins (primary tributaries) emptying the aggressive reddish narrow inside the bodies of the vertebrae and sends efferent intervertebral veins via intervertebral foramina to drain into external vertebral plexus, which in turn drains into segmental veins. The segmental veins are body wall veins, viz. vertebral, posterior intercostal, lumbar and lateral sacral veins. Besides draining venous blood from the vertebrae, the internal vertebral venous plexus gets veins from spinal meninges and spinal cord. The external vertebral venous plexus is located outside the vertebral column and is composed of anterior vessels being located in front of vertebral bodies and posterior vessels being located on the back of the vertebral arches. The anterior and posterior vessels communicate with every other and with the internal vertebral venous plexus. All these veins are devoid of valves. 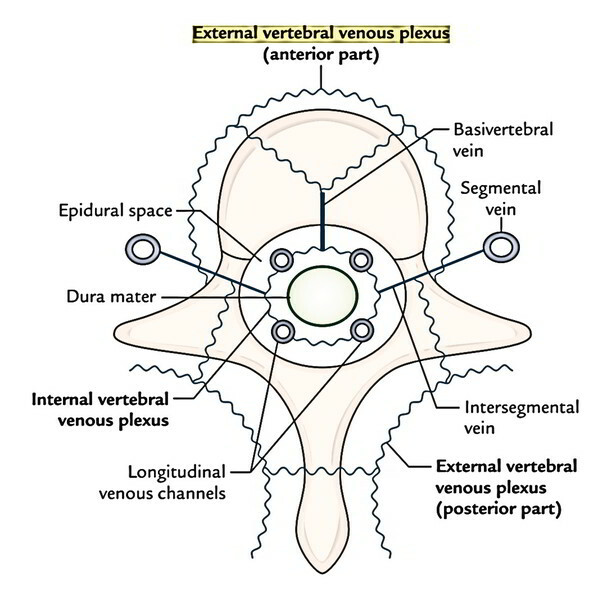 The veins of internal and external venous plexuses and their attaching veins don’t have valves within their lumen. Therefore the blood flows inside these veins in both ways. The internal venous plexus gives a venous bypass when the inferior vena cava neglects to deal with sudden flush of blood caused by unanticipated increase of intra-abdominal pressure as during coughing and straining. It carries venous blood from regions of high venous pressure, example, from the tributaries of inferior vena cava (lateral sacral and lumbar veins) to the tributaries of superior vena cava (posterior intercostal and vertebral veins). Therefore pelvic tumors, notably cancer prostate, can propagate to vertebral bodies and even to skull without needing to go through heart and lungs and create secondaries at these sites.